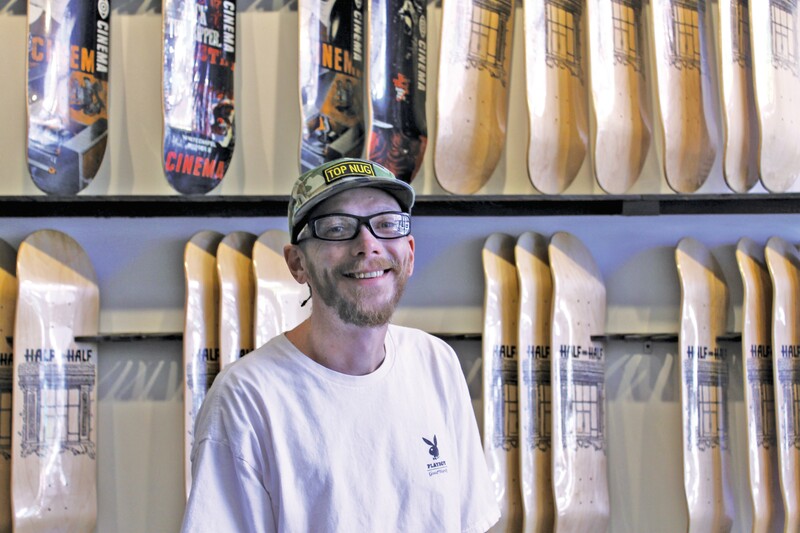 Q&A with Half and Half Skate Shop owner Milhouse Williamson. Salt Lake City's Half and Half Skate Shop—where, as owner Milhouse Williamson puts it, they like "using fun, vibrant and dumb art, but the skating is serious and the homies kill it"—recently competed in the third installation of TransWorld Skateboarding magazine's Shop Showdown. H&H was one of 16 skateshops from across the country to submit a three- to five-minute video showcasing its team's best skateboarding. Videos were pitted head-to-head in a bracket-style tournament which concluded earlier this month. Although Half and Half did not win this year's showdown, the Sk801 crew put it down for the salty state with a video edit that would make even the most this-is-private-property-and-you-damned-kids-can't-skate-here types utter a cheer of approval. How did you get involved in TransWorld's Shop Showdown? Randomly, they actually reached out to us. It was something that was really humbling to have someone like TransWorld hit us up. When did you start filming for the Showdown? They gave us a guideline of what they preferred, and said it was all right to use older clips, but what they really wanted was about a month worth of current clips. That was a challenge in itself. Being that it was the start of March when they hit me up about it, it was, like, 'Great. It's March in Salt Lake City, and we've got to get a bunch of footage.' It was definitely a battle with the weather, but I feel like we came through pretty solid on it. Who are the guys in the video? The video was the people we consider on the Half and Half team. A lot of them support the shop pretty heavily. [TransWorld] wanted the hometown hero. It was really nice having people like Levi Faust, Kordell Black and Caleb Orton, and those names involved because they are Salt Lake's hometown heroes. What was the experience like being in the showdown? I had a really good time with it because I felt like we had a decent edit. The way [the showdown] was set up, it was tough to win and we had a ton of competition—which is great—that's what I wanted. I didn't want it to be something where it was easy. It was the third year they've done [the showdown], and it is the first year that we've been open. It was really just amazing to even be asked and to be part of it. To see [the video edit] blow up on Instagram and see the kids and everyone really hyped on it was just great. What do you think is the philosophy behind a good skateboarding video edit? Skateboarding has made the edit an explanation of what a shop, company or brand is. They use that to tell people about their style and what they like in filming, which is done through angles, lighting, how they introduce skaters and what cutscenes they have. It really is an unlimited pool of how people want to represent themselves. That's why it's so important in skateboarding to define yourself through [the video edit]. If it's not good, that's what defines you. Being able to compete and being able to actually do something worth watching and that some people can really relate to, is where that whole drive comes from for video parts. It's not so much who's the best at what; it's who can make it look the best, and who can have someone film it the best and put it together the best. [Video edits] are a lot more than saying, 'Hey, he can do a kickflip 100 times.' Skating in an Olympic-type competition or in Street League Skateboarding (SLS), is still very impressive. But there's nothing that's as impressive as someone hucking meat down something huge and finally landing it, having it on footage, and having all your friends around you get stoked. That's what skateboarding lives on. What's next for Half and Half? What we are really trying to concentrate on is an HD video. Sam Hubble, a Half and Half team rider, is pretty fired up on an HD setup that he's got. I'm just trying to support that with the shop and get everyone a little part. I'm really hyped to see what happens because it's just going to be all the Sk801 homies.